Hedge Funds and other institutional investors have just completed filing their 13Fs with the Securities and Exchange Commission, revealing their equity portfolios as of the end of December. At Insider Monkey, we follow nearly 750 active hedge funds and notable investors and by analyzing their 13F filings, we can determine the stocks that they are collectively bullish on. One of their picks is Newmont Mining Corp (NYSE:NEM), so let’s take a closer look at the sentiment that surrounds it in the current quarter. Is Newmont Mining Corp (NYSE:NEM) the right investment to pursue these days? Investors who are in the know are turning bullish. The number of bullish hedge fund positions inched up by 5 recently. Our calculations also showed that NEM isn’t among the 30 most popular stocks among hedge funds. NEM was in 31 hedge funds’ portfolios at the end of December. 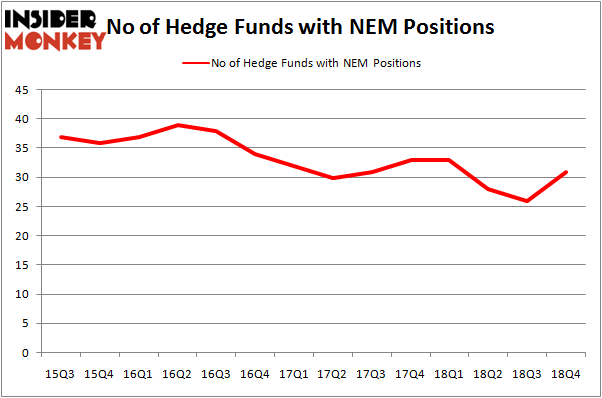 There were 26 hedge funds in our database with NEM holdings at the end of the previous quarter. In today’s marketplace there are tons of metrics market participants put to use to appraise stocks. A couple of the most innovative metrics are hedge fund and insider trading activity. We have shown that, historically, those who follow the best picks of the best hedge fund managers can outclass the broader indices by a solid amount (see the details here). Let’s view the new hedge fund action regarding Newmont Mining Corp (NYSE:NEM). Heading into the first quarter of 2019, a total of 31 of the hedge funds tracked by Insider Monkey were long this stock, a change of 19% from one quarter earlier. By comparison, 33 hedge funds held shares or bullish call options in NEM a year ago. With the smart money’s capital changing hands, there exists a few notable hedge fund managers who were adding to their holdings significantly (or already accumulated large positions). According to publicly available hedge fund and institutional investor holdings data compiled by Insider Monkey, Two Sigma Advisors, managed by John Overdeck and David Siegel, holds the largest position in Newmont Mining Corp (NYSE:NEM). Two Sigma Advisors has a $62.9 million position in the stock, comprising 0.2% of its 13F portfolio. The second most bullish fund manager is Ken Griffin of Citadel Investment Group, with a $42.8 million call position; the fund has less than 0.1%% of its 13F portfolio invested in the stock. Some other professional money managers with similar optimism contain Scott Bessent’s Key Square Capital Management, Cliff Asness’s AQR Capital Management and Mario Gabelli’s GAMCO Investors. With a general bullishness amongst the heavyweights, specific money managers have been driving this bullishness. Key Square Capital Management, managed by Scott Bessent, established the biggest position in Newmont Mining Corp (NYSE:NEM). Key Square Capital Management had $40.7 million invested in the company at the end of the quarter. Jasjit Rekhi’s Sanoor Capital also made a $19.6 million investment in the stock during the quarter. The other funds with brand new NEM positions are Richard Driehaus’s Driehaus Capital, Robert Polak’s Anchor Bolt Capital, and Robert Bishop’s Impala Asset Management. Let’s also examine hedge fund activity in other stocks similar to Newmont Mining Corp (NYSE:NEM). These stocks are Advanced Micro Devices, Inc. (NASDAQ:AMD), SBA Communications Corporation (NASDAQ:SBAC), ORIX Corporation (NYSE:IX), and McCormick & Company, Incorporated (NYSE:MKC). This group of stocks’ market valuations are closest to NEM’s market valuation. As you can see these stocks had an average of 23.75 hedge funds with bullish positions and the average amount invested in these stocks was $526 million. That figure was $406 million in NEM’s case. SBA Communications Corporation (NASDAQ:SBAC) is the most popular stock in this table. On the other hand ORIX Corporation (NYSE:IX) is the least popular one with only 7 bullish hedge fund positions. Newmont Mining Corp (NYSE:NEM) is not the most popular stock in this group but hedge fund interest is still above average. This is a slightly positive signal but we’d rather spend our time researching stocks that hedge funds are piling on. Our calculations showed that top 15 most popular stocks among hedge funds returned 19.7% through March 15th and outperformed the S&P 500 ETF (SPY) by 6.6 percentage points. Unfortunately NEM wasn’t in this group. Hedge funds that bet on NEM were disappointed as the stock lost 4% and underperformed the market. If you are interested in investing in large cap stocks, you should check out the top 15 hedge fund stocks as 13 of these outperformed the market..
Is TransCanada Corporation (TRP) A Good Stock To Buy According To Hedge Funds... Were Hedge Funds Right About Ditching V.F. Corporation (VFC) Here is What Hedge Funds Think About Canadian Imperial Bank of Commerce (CM... 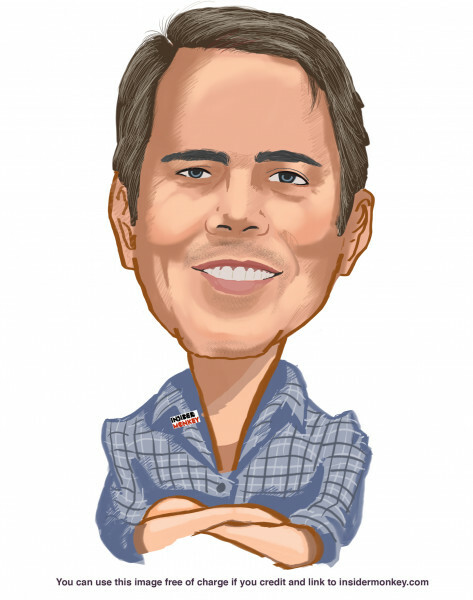 Here is What Hedge Funds Think About Credit Suisse Group (CS) Here’s What Hedge Funds Think About T. Rowe Price Group (TROW) Is Fidelity National Information Services (FIS) A Good Stock To Buy?